Canis Minor is the duo of Thom Karshish on Chapman Stick and Joe Silver on keyboards. Sounds pretty simple huh? Well these two create a full ensemble of deep space instrumental explorations that can be both meditational and mind blowing. At its core, Canis Minor plays ambient space music, but this label doesn't do them justice. Certainly there are space soundscape journeys. Karshish's Stick really extends the music's possibilities and often functions in a keyboard role. To be honest there are times when I don't know whether Karshish or Silver is playing. And a couple times he was jamming away on what sounded like a spaced out Flamenco guitar. Some of the best stuff is on side two which gets noisily chaotic and frighteningly intense, and even at times borders on avant space chamber music. Aside from the array of sounds the two create is the ability of the duo to improvise in a coherent manner that explores, develops, and just goes with a natural flow. All the music is improvised and as Silver explains, "We usually start by picking a key, and then one of us starts playing something we like, timed by whatever the delay setting happens to be. Then the other times his delay to that one and joins in". But overall this is music you can really groove to as well as get completely lost in. The best space music will take you places you've not been before and Canis Minor has found a few unexplored nooks and crannies. Recommended. 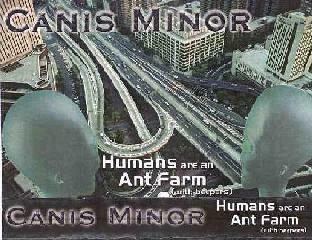 You can visit Canis Minor at their web site.